Grilled on the bottom to golden brown, this cheese, ham and tomato sandwich is so tasty you won't miss the second slice of bread. Spray skillet or griddle with cooking spray. Preheat skillet on medium heat or griddle to 350°F. 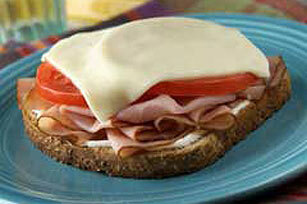 Spread bread with dressing; top with ham, tomatoes and Singles. Cook 3 minutes or until bottom is golden brown.